This is a rare opportunity to own a masterwork of architecture with historical landmark status in Downtown Durham. 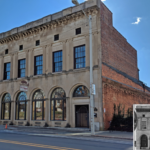 The building was commissioned in the 1920s for The Durham Sun newspa- per afterward merging with The Morning Herald and relocating to Market St. It boosts just un- der 14,000 total SF with approx 7,662 above grade heated SF and 5,928 SF below grade with 9+ ft clearances. A former restaurant storefront space occupies the main level in addition to a recording studio located toward the back of the building. Two rental apartments make upthe 2nd floor both having access to a common area shared rooftop deck. Easily walk to OneCity Center, DPAC, Durham Bulls Athletic Park, and all the other great amenities Downtown has to offer. Please contact Derek Mangum to schedule a tour.